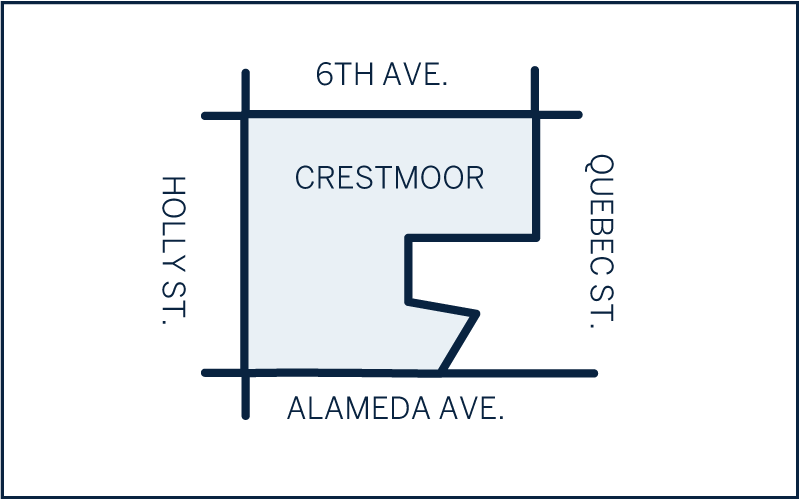 In Crestmoor, it’s all about location, location, location. This popular southeast Denver neighborhood is tucked between two distinct areas – Hilltop and Lowry. It offers sizable ranch style homes to the south, with Victorian and Tudor styles to the north. Due to its ideal location, just two miles from the Cherry Creek Shopping area, Crestmoor is seeing an influx of larger contemporary homes and pop-tops dotting the area. At the heart of the community sits Crestmoor Park, a favorite spot for runners, sports enthusiasts, and families with kids. Its central location means convenient access to all of Denver’s major attractions, while still retaining its own local charm. You’ll pay upwards of $700,000 to over $2 million for homes here. Lowry—planned community east of Crestmoor with restaurants, retail, Starbucks, and a grocery store.